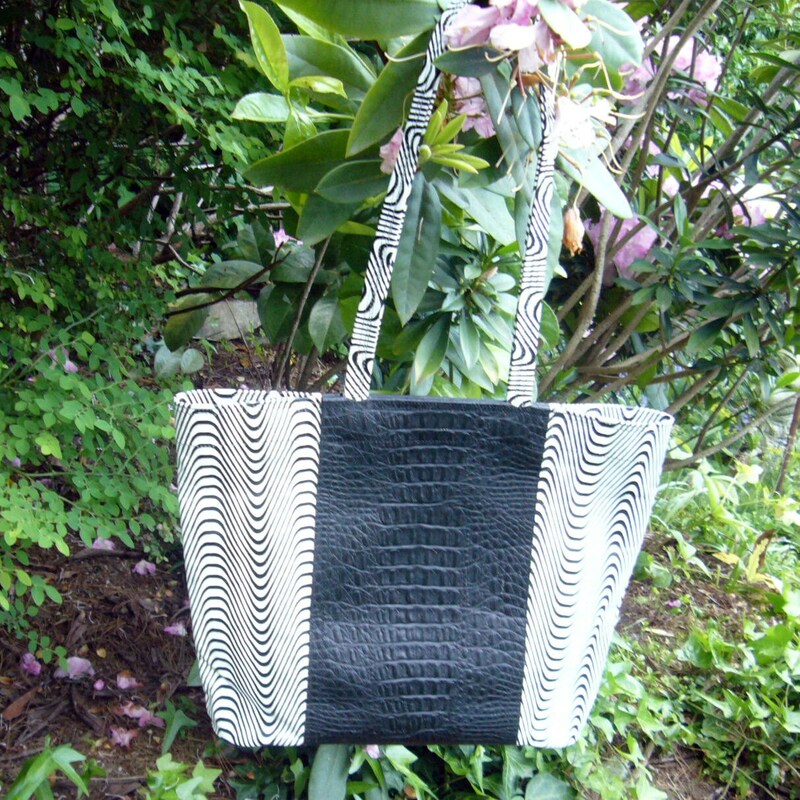 This large leather tote is made with center panels of black embossed crocodile cowhide with undulating black & white striped cowhide. This striped cowhide is super soft and pliable, but the firm center panels help maintain the shape. The center panel is about 7" wide and 12.5" high and also provides extra stiffness and shape to the tote. This hide is natural on the back side, so the inside is tan, but all exposed cut edges are treated with black edge stain. 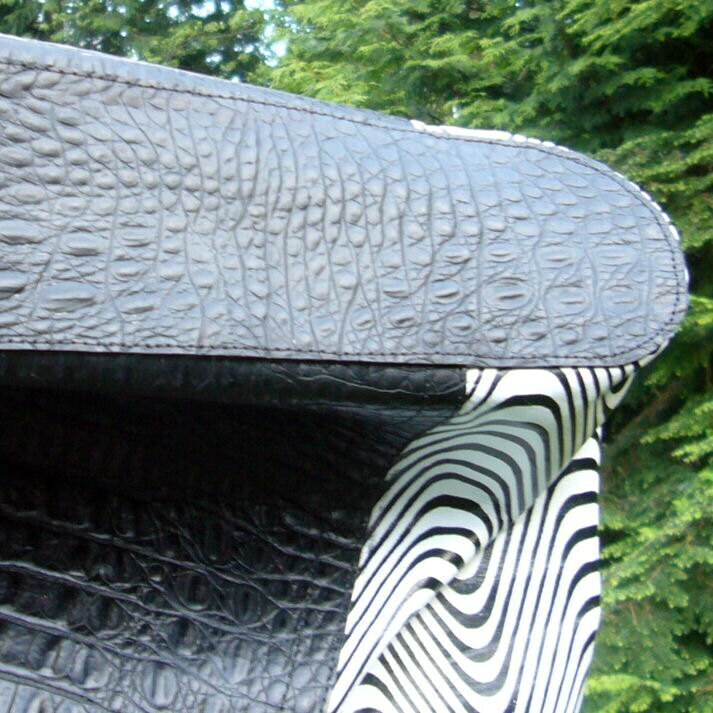 The pattern is modeled after the back of a "hornback alligator", so it has the back and sides. Pending where its cut, there may be effect of a head, too. The inside of the striped cowhide is suede & off-white, and is thin, but very tough. 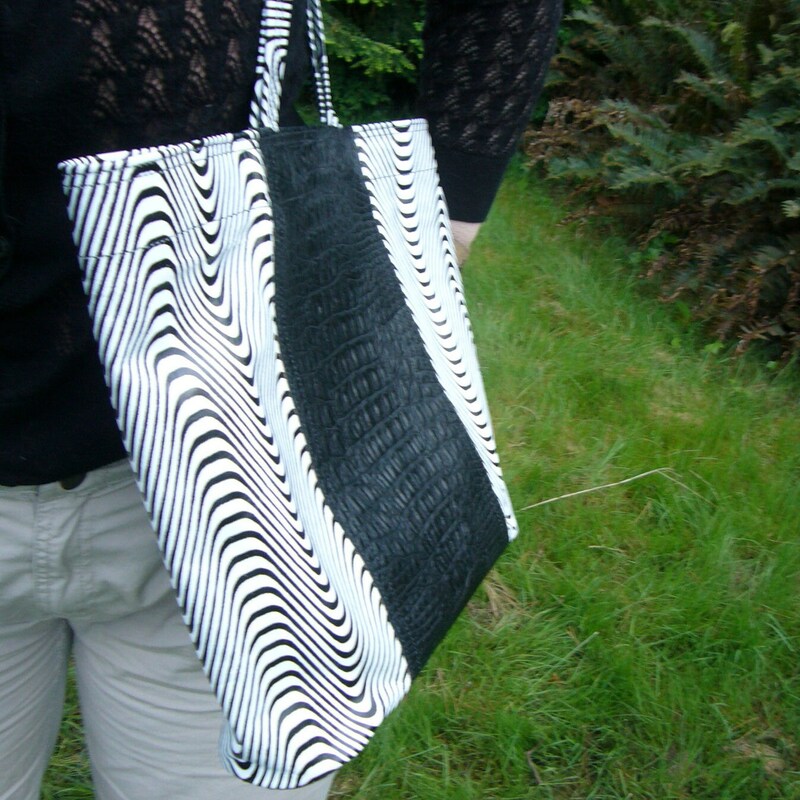 The bag is secured with the sewn-in magnetic closure in the self-facing, and it is 17" across at the top. When combined with the center being stiffer with the sides, the tote creates a flattened "point" making it easy to fill & empty, but keeps the top together and comfortable when under your arm. The straps are about 3/4" wide and 25" long, so the bag fits easily over the shoulder, but doesn't drag on the ground when held in the hand (for most adults). 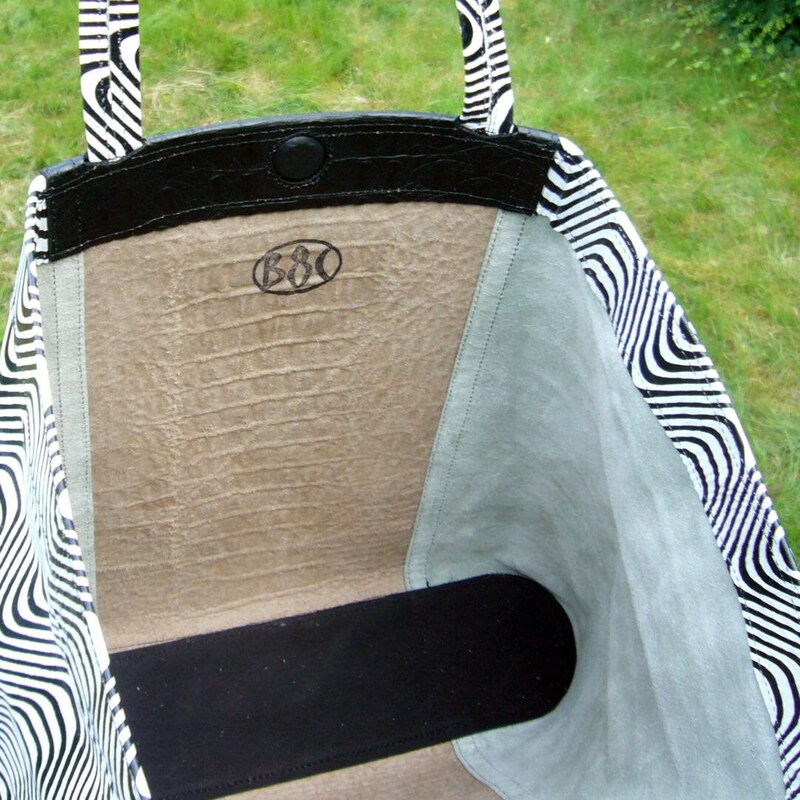 The straps are made of the striped cowhide folded over into the center, and top stitched. For a bit of fun, there are three rows of stitching, and this is repeated on the top of the bag. The straps exit through stamped slots and are glued and sewn into the facing for neatness and strength. 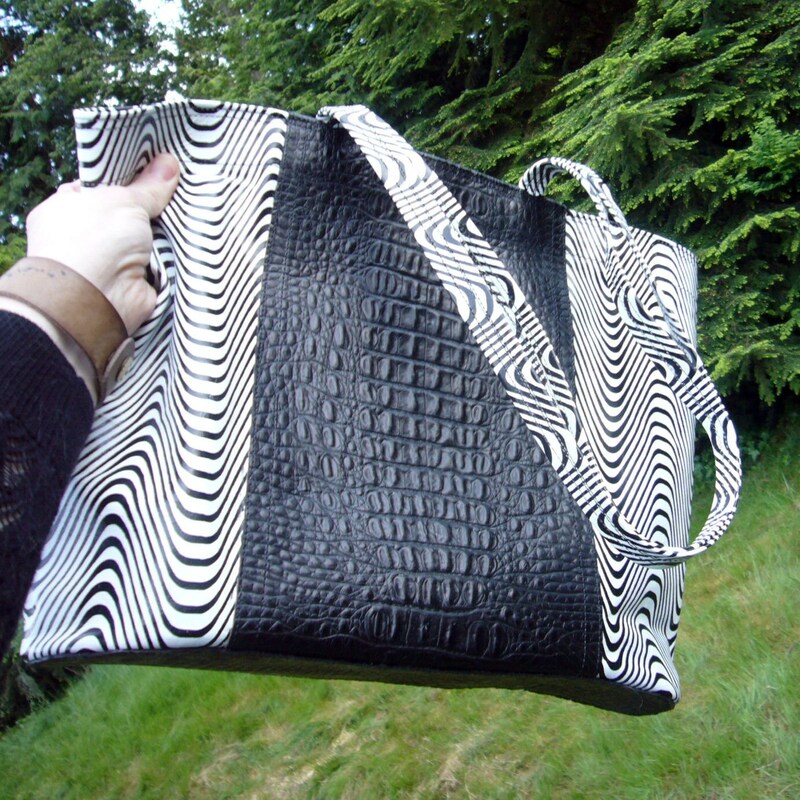 The base is and is 13.5" long and 3.75" wide with rounded ends, and made from two layers, with a thick black cowhide on the inside, and a layer of the black croc is glued and sewn for the outside, with the tote body sandwiched between the layers for a smooth bag bottom.